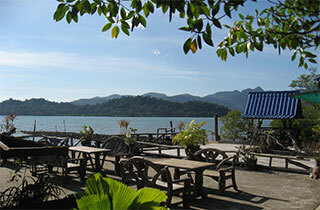 Koh Chang’s East Coast offers a relaxing change to the bustling west coast. Covered in rain forest, overgrown in places, with fruit orchards and rubber plantations woven in to the landscape. Mangrove forests stretch out along the coastline. Although beaches are mostly stony there are some small sandy beaches to be found. Long beach in the far south has a particularly nice sandy beach. Fishing and Kayaking to the island in Jek Bae are both popular activities. 4 days, 3 nights accommodation at good quality resorts, return transfers from Bangkok or Pattaya, excellent food, an all day Island Snorkeling Tour and an afternoon kayaking through mangrove forests in Salak Khok. East Coast Snorkeling Tour travels to 4 tropical islands in the Koh Chang National Marine Park. You will have the opportunity to explore some of Koh Chang's neighbouring islands, their beautiful corals and marine life. Leaving from the the Marina at Salak Phet you will then visit the islands of Koh Laoya, Koh Thong Rang, Koh Rang and Koh Wai.